In order to always have a quality face and hands care cream on hand, it is not necessary to spend a whole week in pharmacies and cosmetic stores on expensive products, in advance hoping that their price will be directly proportional to the quality of their effect on the skin. You can perfectly prepare an excellent nourishing cream, using what can be found in the nearest store or at home. The composition of the home cream contains four components: base oils, aqueous base, emulsifiers and additional components (active substances, essential oils, etc.). Base oils are, in fact, the foundation of the future product, the amount of which must necessarily be at least 30% of the total proportions. For different skin types, it is recommended to use different oils. For example, walnut oil, macadamia nut oil, coconut, peach, apricot, olive, sesame oil, and also avocado, jojoba or shea butter are the most suitable for dry skin owners. For oily skin it is recommended to use watermelon, corn, almond oil, oil from black cumin or grape seeds, milk thistle, hazelnut. If you have sensitive skin, try using sea buckthorn, rose, lemon or St. John's wort oil. Burdock oil is also suitable. Water base includes only ordinary water, distilled or boiled. You can also use tea, floral or herbal decoction. The water base should be at least 60% of the total proportions. Emulsifiers combine the components of the future cream together. As a given ingredient, you can use something simple and homemade (like egg yolk), and pharmacy substances like glycerin, lecithin or lanolin. Also, as natural emulsifiers, cosmetologists are advised to add emulsifiers from wheat (emulsion, xylans) to provide a quick absorbency cream. 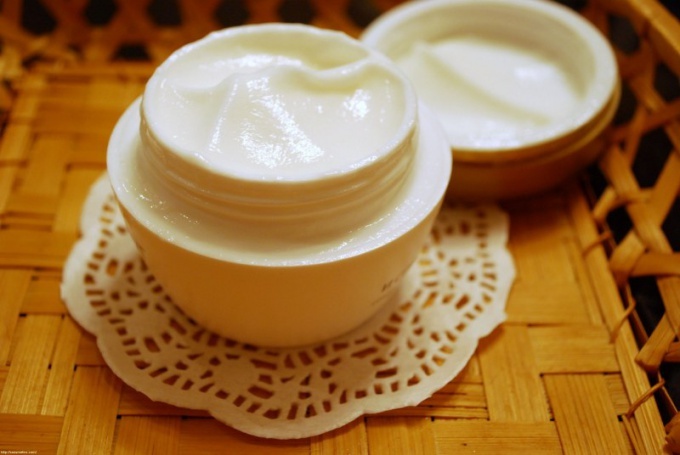 Homogeneous structure of your home-made cosmetic product can give co-emulsifiers, for example, shea butter, cocoa butter. For dry skin, guar gum or beeswax is recommended, for fatty – cetyl alcohol or sucrose stearate, for sensitive – sodium alginate or stearic acid. Almost all these components you will find in pharmacies or shops of natural cosmetics. In the role of additional components are usually plant extracts, vitamins and essential oils. Here, the choice of ingredients is also determined by the type of skin. For example, if you have oily skin, then as an extract you should add dry yeast, if dry – then an extract of pumpkin seeds or linden, if you have very sensitive skin, then you will most prefer extracts of chamomile and peonies. With essential oils, everything is a little simpler – no matter what type of skin you have, cosmeticians in any case recommend the use of geranium oil, ylang-ylang, patchouli or lavender. All solid components are ground into chips (with a knife or on a grater) and mixed with liquid ingredients. Next comes the oily foundation, which is mixed with water, poured into a container, put in a pot of water and in this form is heated on the stove. After warming up, add emulsifiers to the oily base (it is desirable that the temperature in both containers reach 60 degrees), stir until they dissolve, then, without stopping stirring, add more water. Stir is recommended always in one direction. Remove the mixture from the heat, again stir well (you can beat it with a mixer for a faster, more uniform effect) and wait for your cream blank to cool. Depending on the recipe, you can also add additional ingredients and essential oils during the stirring process. As soon as the billet acquires a uniform structure, it will cool and visually begin to resemble a nourishing cream, you need to put it in the refrigerator for a fairly long time (from a week to two). Be patient, as soon as this time passes, you, finally, will become the happy owner of your own exclusive cosmetic product, designed exclusively for the characteristics of your skin.